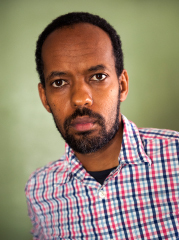 Growing up in Ethiopia, Eyakem Gulilat was unfamiliar with the way his home country and its people were represented in the West until he moved to the United States in 1996. Through his work, he has applied photography and his new perspective as an Ethiopian-American to investigate themes of identity—cultural, familial, or race-related. In his project Collaborative Self, Gulilat creates triptychs composed of portraits of himself and a friend or stranger, each wearing traditional Ethiopian clothing, separated by a photograph of their shared environment, the Oklahoma landscape where Gulilat currently resides. The symbolic nature of clothing influences not only how people feel and carry themselves within their dress, but also how the clothing is read and responded to by others. Gulilat also plays on traditional notions of portraiture—in which the photographer has complete control and is completely removed from the image—by allowing his sitters to turn the camera on him; posing and directing him as they desire. The resulting triptych reaches beyond portraiture to become a conversation. Photography is a passport to storytelling of the unheard saga of humanity.